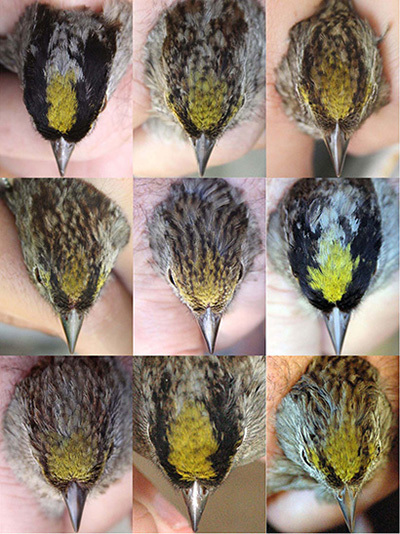 Birds with bold crown coloring are dominant over those with duller crown colors. Though highly territorial on their summer breeding grounds, golden-crowned sparrows form winter flocks with the same birds year after year. 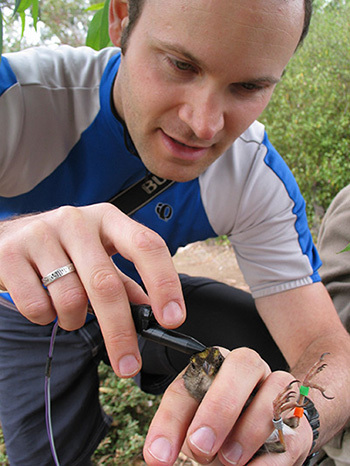 Alexis Chaine measures the crown colors on a golden-crowned sparrow at the UC Santa Cruz Arboretum. 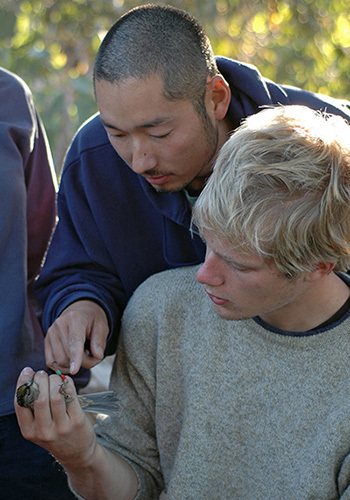 Dai Shizuka works with an undergraduate studying golden-crowned sparrows in the Arboretum. 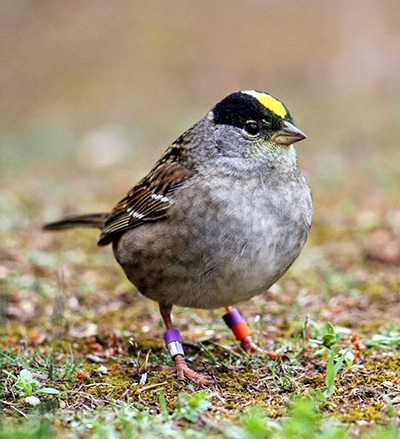 An understanding of the social networks of wintering golden-crowned sparrows emerged from work led by Daizaburo Shizuka, another former graduate student in Lyon's lab who is now at the University of Nebraska in Lincoln. 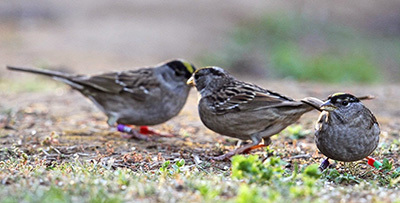 A study published in 2014 showed that the same birds come together in the same locations year after year, forming short-term feeding flocks that are subsets of distinct social communities with well-defined home ranges. They do this after migrating thousands of miles from their summer breeding grounds in northern Canada and Alaska, where instead of forming flocks, they fiercely defended small individual territories around nesting sites. This work was funded by UC Santa Cruz, CNRS, and the National Research Agency of France (ANR).